I hope they go out of business in 6 months. I hope Sterbcow starts his own realty company and takes all L & B's employees. I suppose they won't be contacting me for an ad will they? Shoutback: To the guys at Slabbed. I've only been following them for about a week and this blog is something to behold. They have the 411 on Jeff. Parish, fo' true. Hang tight on Chehardy, this guy has pissed me off...time to do some digging. We all need to pull together, and shine a light on those that will not pay their fair share. Thank You Arthur for standing up! And no I do not know you. 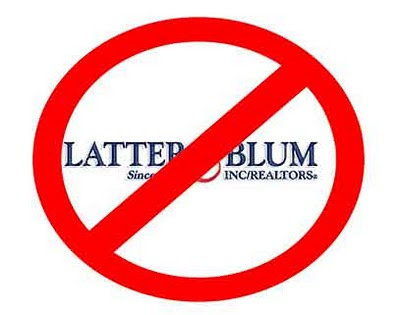 I will not use Latter & Blum in the future. Will You? I don't do Real Estate, so I wouldn't know this, but why aren't Broker Price Options public informatoin anyway? We have a legislative session coming up and if it makes sense to do this, let's get someone to write a bill. It could be a good fight and it may raise awareness on poor assessors/assessments. Can anyone out there explain this? Nothing like the long arm of JP corruption snaking its way into this parish. As if we didn't have enough problems here already. "First let me say that Arthur is as fine and smart a person as I know, like Arthur I am for good government, I have supported Arthur in his INDIVIDUAL efforts, he crossed the line when he injected my company into the middle of politics, that should not have happened. I have no axe to grind with Chehardy pro or con, met the man once 10years ago. Our business is selling and leasing real estate not politics. Sorry you feel the way you do, my job is to protect L&B." ...to which i replied that because L&B isn't willing to advocate good government is why I and others won't do business with it any longer. Crossing the assessors wouldn't have hurt L&B as bad as this revelation has. The Real Estate Industry is all about controlling access to information. I'm sure Latter & Blum spent a lot of money gathering the information they have. All sales information should be public information, available from government sources but is often outdated and inaccurate. Exactly what Chehardy could do to Latter and Blum directly is somewhat limited. He could be vindictive if they represented someone in an assessment matter or issued an opinion on behalf of someone. The only other way I can see he could really hurt them is by influencing other officials not to do business with them or block their private business investments. That would mostly be commercial business. Slabbed has been on this long before the T-P and have very very good extra info on this whole story. Broker Price Opinions (article mistakenly called them "options") are just that, a brokers opinion of price. Done by a licensed agent/broker. Much less expensive (and arguably less precise) than an appraisal, which is done by a licensed appraiser. Not public at all, technically the property of whoever paid for the opinion. Appraisal and assessment are pretty complicated stuff, not that transparent and thus ripe for abuse/misuse/incompetence. I think the TP article on Jefferson focused on Broker Price Opinions vs assessed value, and apparently Sterbcow had some LB agents prepare the BPOs. In contrast, the TP’s recent article on OP assessments compared actual sale price to the assessed value before the sale, a better way to compare that uses PUBLIC data. Chehardy complained in a letter to the editor that their techniques were ‘bogus.’ While I can’t vouch for the accuracy of his assessments, he might have a point about the story and their techniques. Arthur Sterbcow was fired because he stood up to Bob Merrick regarding the imminent threat and exposure to sexual harassment lawsuits due to Bob Merrick's constant and persistent harassment of the young female employees/agents. He also thought Merrick's distasteful behavior reflected negatively upon the company. Sterbcow is a class act. I know both he and Merrick, it's unfortunate what happened but ultimately the best thing for Arthur to distance himself from Merrick. Not exactly that boy scout image he's peddling.